The response to our iPad contest has been extraordinary, so we've extended the deadline until December 31. Just make ten approved Connections before then and you're automatically entered into our drawing for a free iPad. Many Tradeloop members are building their own private networks and there are a lot of open Connections requests. We want to enter every Tradeloop user into the drawing, so check your Connections page and respond to your invitations. Make at least ten Connections and you could be the winner on December 31. At the Dealer Directory, search for individuals you want to add to your Trusted Network. Go to the person's profile page and click on the "Add name to your Network" link. Type a short personal invitation at the "Request Connection" page. The Manage Connections link on your Tradeloop Account Home page displays the status of your network. It tells you who's Connected, who's invited you to join their networks, and lists the invitations you've sent. This is your last chance! Send out your own Connections invitations and respond to the ones you receive. 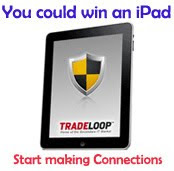 You could be the lucky Tradeloop member who celebrates the new year with a new iPad. Learn more about the drawing at our official iPad Contest page.